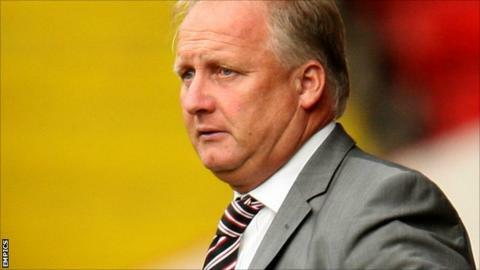 Bury have appointed former Sheffield United and Leeds boss Kevin Blackwell as their new manager. Blackwell has been without a managerial position since leaving Bramall Lane by mutual consent in August 2010. The Shakers have been searching for a new boss since Richie Barker left Gigg Lane on the eve of the season to take charge of Crawley Town. Bury, currently bottom of League One and without a win this season, travel to Stevenage on Saturday. The 53-year-old returns to Gigg Lane, more than a decade after serving as goalkeeping coach and assistant manager under Neil Warnock. His first job as manager came with Leeds in 2004, soon after their relegation from the Premier League. Following a massive overhaul of the squad at Elland Road, Blackwell led them to the Championship play-off final in 2006, where they were beaten 3-0 by Watford. His contract was terminated four months later and a 10-month spell with Luton Town followed, although significant financial problems at Kenilworth Road led to his departure. Replacing Bryan Robson as Sheffield United manager in February 2008, Blackwell took the Blades to the play-off final in his first full season in charge, but he again suffered defeat, losing 1-0 to Burnley. He left Bramall Lane two games into the 2010-11 season and has since been coaching in the United States and Nigeria. Peter Shirtliff, who was placed in caretaker charge of the Shakers after Barker left for their League One rivals on 7 August, is expected to remain as part of the coaching staff at Gigg Lane. Blackwell will be officially presented at a media conference on Thursday.